As I was engaging in “educated speculation” on the possibility of Las Vegas Desert Knights being the new NHL team name last week, I acknowledged that I could have missed a domain registration related to the team, and it turns out that I did. On Saturday, a handful of domains containing the name Las Vegas Sand Knights were registered privately through a variety of registrars. The name sounds ridiculous enough that I initially didn’t think much of it, but just to be sure I poked around a little bit. It turns out that sandknights.com was registered publicly to Black Knight IP Holding Company, LLC – one of Las Vegas team owner Bill Foley’s companies – on August 23. This definitely muddles things, as the domain was registered on the same day that trademarks were filed for Desert Knights, Silver Knights, and Golden Knights. The big question is why Black Knight would trademark three names at the same time as registering the domain for a name they did not trademark. Additionally, why would they register the Desert Knights domains privately and then turn around and register sandknights.com publicly? On top of that, no domains other than sandknights.com related to that name are registered publicly to Black Knight. Related private registrations include lasvegassandknights.com, lvsandknights.com, and vegassandknights.com. Foley has already stated that the backup plan is Las Vegas Nighthawks. We’re at a point in the process where we should be seeing fewer names as options, not more. It could be that this is just misdirection on behalf of the Las Vegas organization. It could be that everything up until this has been misdirection. I don’t know. So Las Vegas Sand Knights emerges as a possibility but it might raise more questions than answers. Just hours after the owner of the NHL’s coming expansion team in Las Vegas, Bill Foley, confirmed to Amber Dixon of NBC Las Vegas that his organization was the one who had registered domains related to the name “Las Vegas Desert Knights” – a name that I first speculated on earlier this week – three trademarks filed by his organization were published to the United States Patent and Trademark Office Database. 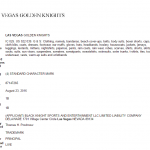 On August 23, Black Knight Sports and Entertainment – Foley’s company – registered Las Vegas Desert Knights, Las Vegas Silver Knights, and Las Vegas Golden Knights. Variants where “Las Vegas” is replaced by “Vegas” were also registered. It’s worth noting that Foley’s organization does not seem to own any domains related to the Golden Knights name. The Las Vegas organization had previously stated that they owned domains and trademarks related to Las Vegas Silver Knights. The Silver Knights domains were registered privately in April – possibly by Black Knight Sports and Entertainment – but we now know that they did not own the trademarks at that time. On August 11, Foley said that – in addition to three Hawk-related names – two more names had yet to be filed. Desert Knights is the only name with domain registered since that date. Update (8:25 AM): It might be worth noting that, while lasvegasdesertknights.com and lasvegasnighthawks.com (for example) do not have DNS properly configured to deliver an actual site, lasvegassilverknights.com currently redirects to a “For Sale” page. I never thought the timeline on the Silver Knights domains made sense, as those were privately registered in April, then the Hawks-related domains were publicly registered in July. Why go private, then back to public, then private again (for the Desert Knights domains)? I think that Foley doesn’t actually own the Silver Knights domain (remember, he said he owned the trademark earlier this month when it clearly wasn’t filed until this week). That would make Desert Knights the only name that he owns both the trademark and the domain for. Let me be clear, that part is just my speculation based on lasvegassilverknights.com acting differently from the other Foley-owned domains. Just hours after it was announced that Red Wings’ defenseman Niklas Kronwall would miss the World Cup of Hockey with an injury, another Red Wing and a Detroit prospect were revealed to have had surgery and could miss the start of their seasons. Forward Tomas Jurco injured his back while training and prospect defenseman Vili Saarijarvi of the Mississauga Steelheads had wrist surgery. Per Ken Holland, Red Wings F Tomas Jurco has had minor back surgery (hurt self working out), 4-6 weeks of doing nothing, then month rehab. Per Ken Holland, Red Wings prospect D Vili Saarijärvi has had wrist surgery, out about two months. By losing the start of his season, Saarijarvi will miss his return to Flint on October 14, as well as his only games in Saginaw, Sarnia, and Windsor. Jurco’s injury – combined with that of Teemu Pulkkinen – could temporarily help clear up Detroit’s logjam at forward. New Las Vegas Team: Desert Knights? Since stumbling onto one of the possible names for Las Vegas’ new NHL team – the Las Vegas Nighthawks – I’ve been looking out for other interesting domain registrations that could be tied to the team. Last Thursday, a trio of domains were registered that piqued my interest, containing a new name that hadn’t been mentioned before. 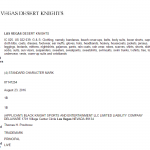 Unlike the registrations for the Nighthawks, Red Hawks, and Desert Hawks domain names; lasvegasdesertknights.com, vegasdesertknights.com, and desertknightshockey.com were private registrations. That means that there’s nothing directly tying them to the Las Vegas organization. The team did not respond to a request for comment. Why do I think this might be the name, then? The domains are registered through Moniker Privacy Services. While the fact that anyone can use that service means I don’t know for certain that they belong to Foley, Moniker just happens to be the registrar through whom NHL.com is registered. Hardly conclusive but an intereresting coincidence. More importantly, Foley said that further registrations were coming and this set of domain names is the only one I’ve seen that hits the intersection of hockey, Las Vegas, contains the word (k)night, and is not obviously a domain speculator. We know the team name has been decided on. It would be bad business for them to not register related domains, as leaks become more likely with more people in the know. They’d be setting themselves up to have the domains snatched out from under them. It’s possible that this is a domain speculator and either the actual name hasn’t been registered yet or I’ve missed it. I just think it’s more likely that Las Vegas Desert Knights is the new team name. Call this educated speculation. S/T to Jenny Jensen for noticing that NHL.com also uses Moniker. Update (8/26, 9:40 PM): Per Amber Dixon of NBC Las Vegas, Bill Foley has confirmed that he purchased the Desert Knights domains. It’s important to note that while he confirmed the purchase of the domains, he did not confirm that Desert Knights will be the team name. That said, it’s getting to be very late in the game for registering contingency domains. Author Clark RasmussenPosted on August 24, 2016 August 26, 2016 Categories Blog Post, Misconduct19 Comments on New Las Vegas Team: Desert Knights? The National Hockey League announced today that Team Sweden has replaced injured defenseman Niklas Kronwall of the Red Wings with Hampus Lindholm of the Anaheim Ducks for the upcoming World Cup of Hockey. Obviously “better” is a relative term. If I were the Swedes, I’d rather have Lindholm than Kronwall anyway, so they might be taking advantage of Kronwall’s past injury to make that switch. I was recently asked to review the Detroit Free Press’ Gordie: The Legend of Mr. Hockey. Due out in a couple weeks, the book is a collection of stories about Gordie Howe‘s career and a celebration of his life. I say “a collection of stories” because it’s not a single, chronological narrative. It doesn’t read like a standard biography. Starting with an obituary by Mitch Albom and coverage of Howe’s visitation at Joe Louis Arena and his funeral, it moves on to a brief biography of his playing years in the context of his recent death. These aren’t new or exciting stories. If you were paying any attention last June, you’ve already read some version of them. They are a fitting tribute, however, and a beautiful read. From there it’s on – somewhat jarringly – to the debate about Howe’s controversially stem-cell treatment in 2014. Then to anecdotes about Howe from the Freep’s writers and Howe’s contemporaries, and quotes from Howe himself. The book closes with excerpts from Mark Howe‘s book, Gordie Howe‘s Son, and from the 1999 Free Press book, Century of Champions, before a look at Howe’s single-shift appearance with the International Hockey League’s Detroit Vipers and a recap of his career statistics. The knock on this is that it’s structured like a coffee table book but it’s a paperback, with the result something more like a Sports Illustrated collector’s edition. Of course, like those SI issues, collectors of Red Wings memorabilia will want this on their bookshelves. As I said, you won’t find anything new here. My favorite part was the Mark Howe piece, which was just an excerpt from another book. These aren’t new stories but the value is having them collected in one place. Gordie: The Legend of Mr. Hockey, will be available on September 1. On Las Vegas’ NHL Team Name: Nighthawks? I was chatting this morning with SportsLogos.Net founder Chris Creamer, spit-balling ideas about the name of the NHL’s Las Vegas expansion franchise, when I stumbled onto something interesting. On Tuesday, team owner Bill Foley was on Sportsbook Radio and SI (among others) picked it up. But the name is going to have … Knights somewhere in some fashion, some way. Or, there’s one particular animal, a bird, that we have available to us that we might use. I ignored it when it first came across my Twitter feed. Frankly, I didn’t care that much. This morning, though, I started thinking about it and ran down Wikipedia’s list of birds native to Nevada. Some of names just don’t make any sense for a hockey team to use. The Las Vegas Trumpeter Swans? Las Vegas Wood Storks? No thanks. Las Vegas Goldeneyes? Maybe in the 1990s (looking at you, Toronto Raptors). Las Vegas Canvasbacks? Hrm. That’s a little too perfect. A bird native to the state. The nickname of the F-117, which was tested at nearby Nellis Air Force Base. A word for a person up late at night, something Las Vegas is known for. So I checked to see if the domain lasvegasnighthawks.com was available, thinking that I might squat on it if it was, just in case. It turned out that it wasn’t available. In fact, it was registered to Black Knight IP Holding Company, LLC, one of the many realms of Foley’s empire. Domains aren’t any kind of be-all, end-all – anyone can register one for whatever reason – but it does seem to show that Foley’s organization was thinking about Nighthawks. Creamer’s further research found a small handful of other names that the team might have been considering. It seems as though no trademarks have been filed, so they can always switch direction. That said… Foley said a bird that also includes (k)night in its name? Nighthawks seems to be a perfect fit. Update, 10:45 PM: I was on KLAS in Las Vegas tonight to talk about this. They confirmed that Nighthawks, Red Hawks, and Desert Hawks have all been trademarked and that two other names are pending. Update, 8/12/2016 – 3:45 PM: I’ve already discussed this on Twitter but, for the sake of completeness, I figured I’d circle back to this post. Team confirmed our list last night, now hearing LasVegas has eliminated all 3 Hawks names & chosen something else. Didn’t like fan response? For whatever reason, it would appear the names we found are now off the table.